The recent heat wave across many parts of southern Europe, including Slovenia, has seen temperatures in the mid-high 30s. I LOVE the heat and HATE the cold, so I haven’t been complaining, and since Slovenia is almost 60% covered by forest and there are rivers and streams aplenty, there’s always somewhere to escape the heat. 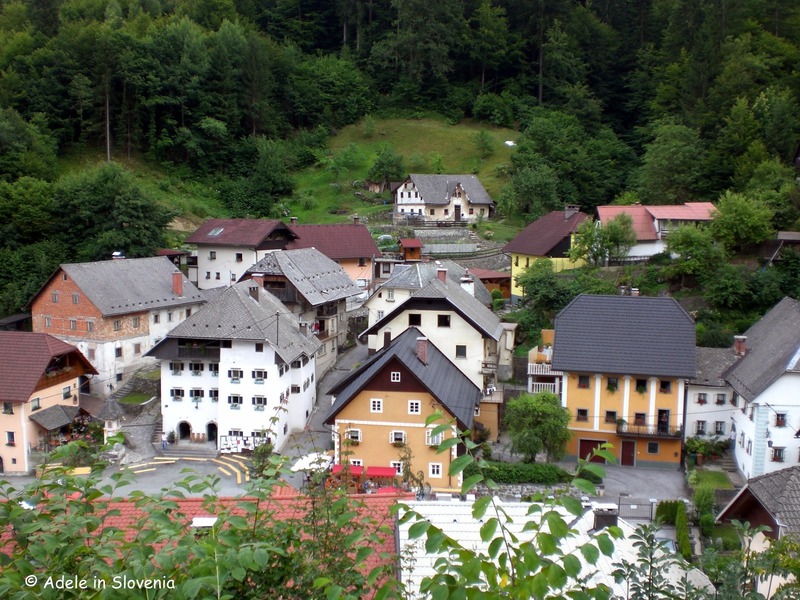 One such ‘cool’ place is Kropa – the cradle of Slovene iron forging. Due to its location, nestled into a corner at the foot of the Jelovica plateau, Kropa remains cool even on the most sweltering of days. 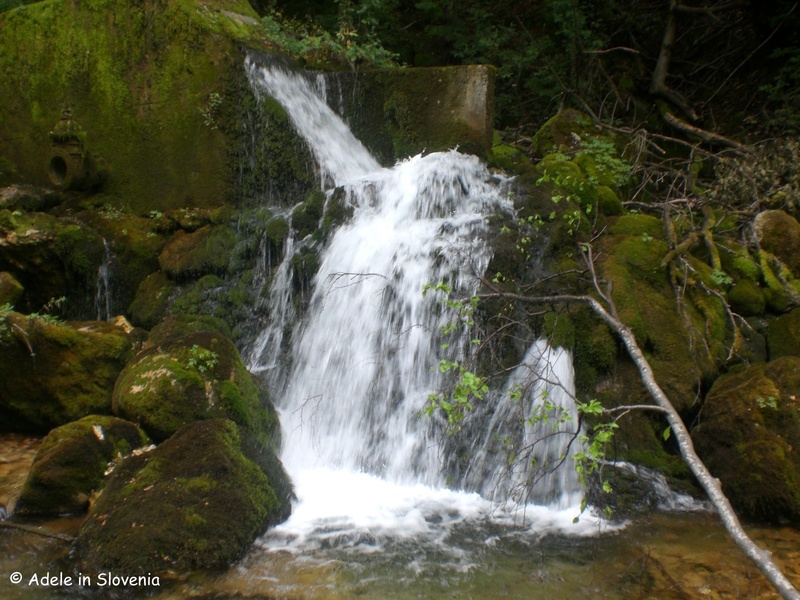 The Kroparica stream is one of the two streams that springs from the foothills of the Jelovica plateau. 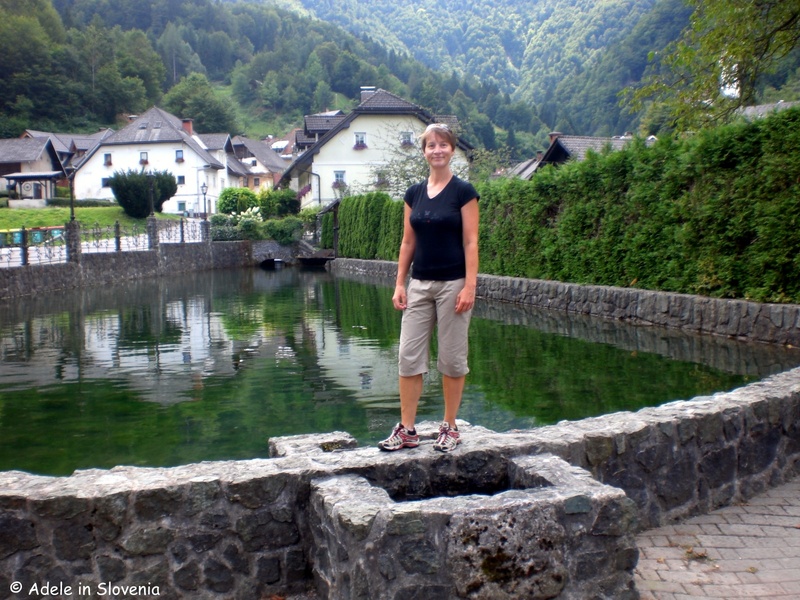 The stream runs through the heart of the village and joins the other stream – the Lipnica – before continuing through the valley to meet the Sava river at Podnart. In September 2007 the stream, which ironically was once the lifeblood of the village, burst its bank following heavy rainfall causing flooding and significant damage – as can be seen by the video below. 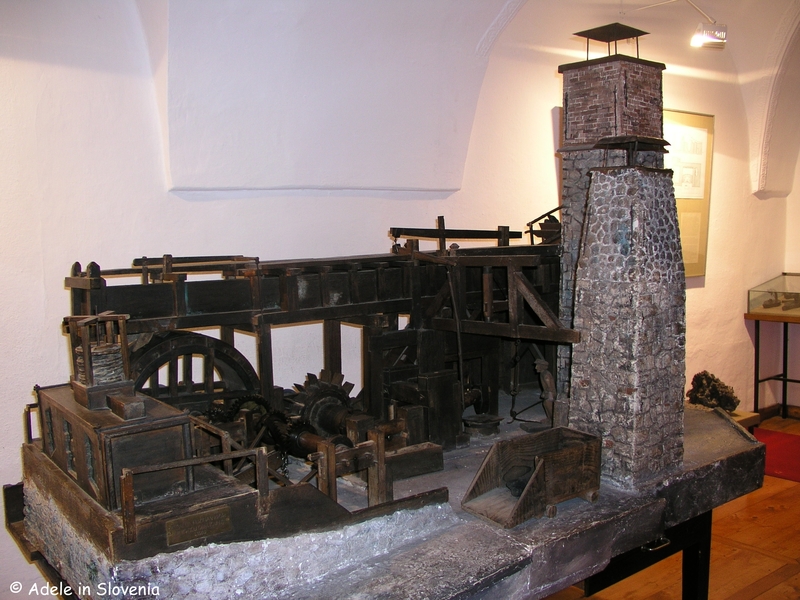 In its heyday of nail-making in the 18th and start of the 19th century, the ironworks in Kropa and nearby Kamna Gorica employed more than 2000 people. The most important markets at that time were the area of the Republic of Venice and Trieste. In the lower part of the village you can see the renovated pool which is a remainder of the lower foundry, whilst in the upper part of the village the water cascade, water troughs and barriers are remains of the upper foundry. The Vigenc vice nail forge, located in the upper part of the village, is the only preserved foundry for the manual forging of nails with an authentic preserved exterior and blacksmithing equipment inside. It is situated on the left bank of the stream below the dam of the former upper foundry. Next to the stream there is a wheel for driving the bellows, the interior contains three blacksmiths’ fireplaces. Around each fireplace there are six stone stumps for anvils, above the fire in the centre is the ‘kitchen’, the place where blacksmiths’ wives put their pans and cooked whilst working. When walking around the village you can see some of the preserved technical objects beside the Kroparica stream which are evidence of the former lively ironworking industry. 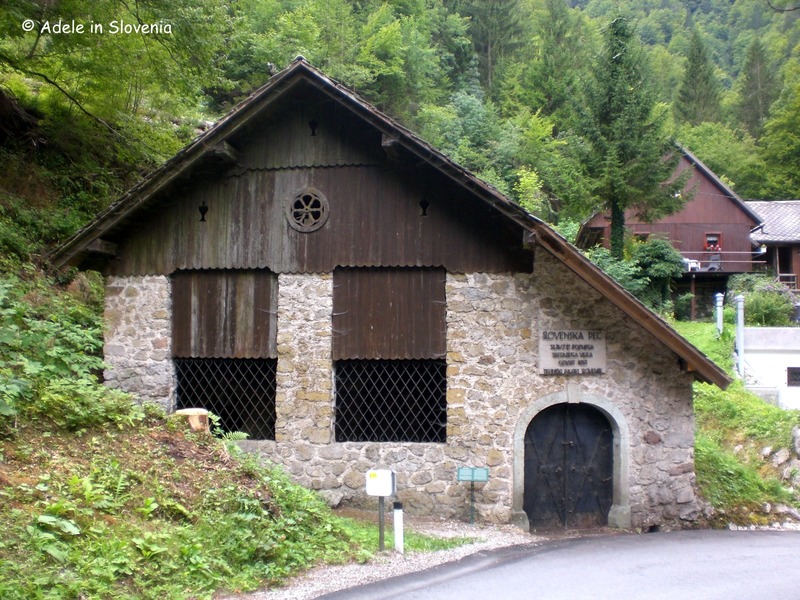 The Slovenian smelting furnace (Slovenska peč), dating from the 14th century, is located on a bend in the winding road that leads from Kropa up to Jamnik. Archeological remains of this important technical monument were discovered in 1953 and a protective building was erected to preserve it. The smelting furnace was 3 metres high and in 10 hours it produced 200 kilogrammes of wrought iron for forging. Just after passing the furnace, you will see a sign on the right-hand side of the road to Vodice – one of the many hiking paths that lead to the Vodiška planina highland and the Partisanski dom na Vodiški planini hut. 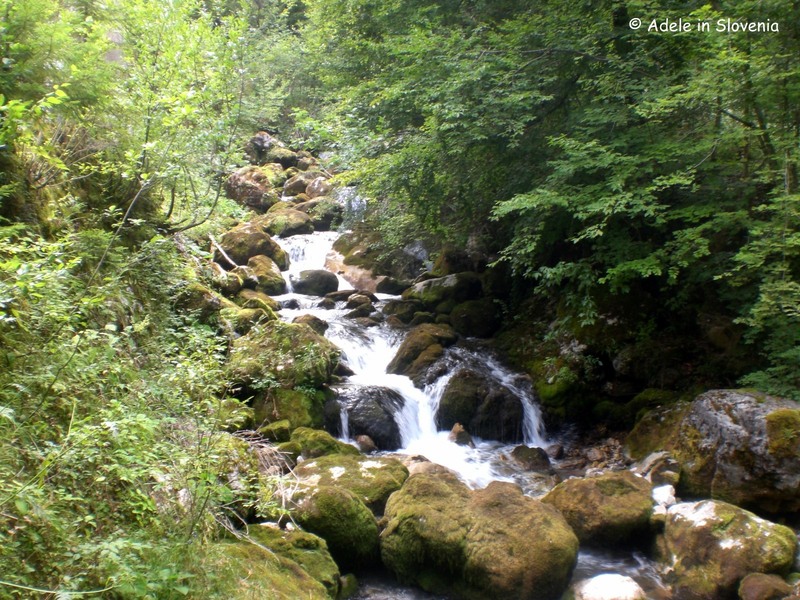 If you would like to see the source of the Kroparica stream take this path but do NOT cross the small wooden bridge, continue instead ahead, slightly uphill on a somewhat overgrown stone path for a few hundred metres to reach the source. The path isn’t marked but just follow your nose, and the water! The stream makes its way down from its source through the village through artificially constructed water drainage systems and barriers through which water from the stream’s main channels ran to the ironworks and blacksmiths workshops. 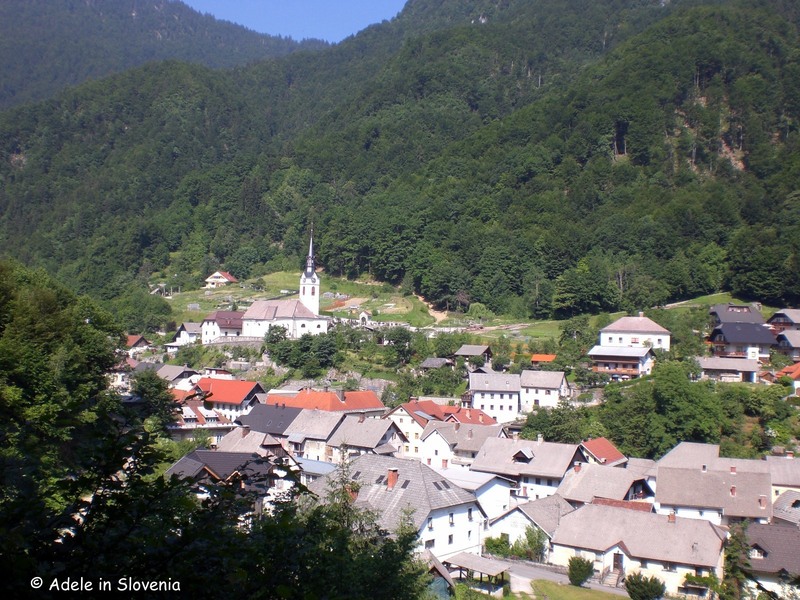 The ever-popular annual Iron Forging Festival (Kovaški šmaren) will take place this Saturday 8th July in the village of Kropa, the cradle of Slovene iron-forging. I love visiting Kropa in summer, when it’s hot and the village is bathed in sunshine, and especially at the time of the Iron Forging Festival when the village comes to life and visitors can get a glimpse into life in the past for the village ironworkers and their families. Kropa sits nested into the far eastern edge of the Jelovica plateau and is crammed with interesting sights and architecture and preserved technical heritage which is showcased during the annual festival. 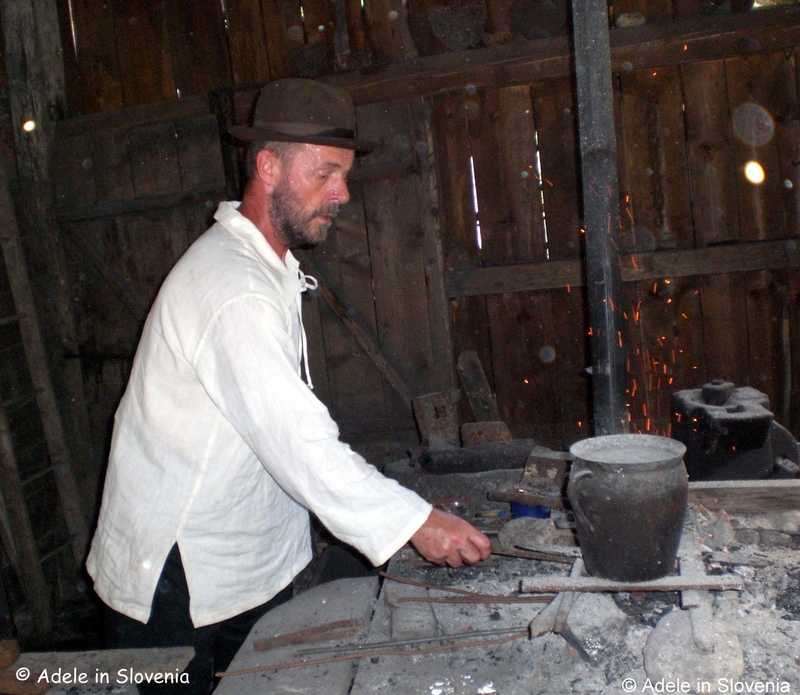 There are demonstrations of hand forging of nails in the Vigenjc Vice Nail Forge, a small local craft market, old-time bikes, open days at the Iron Forging Museum and the Fovšaritnica Museum House, as well as at the headquarters of the company UKO Kropa, which specialises in all manner of wrought iron furnishings and fittings and is keeping the village’s iron-forging tradition alive. Be sure to take a walk around the village, alongside the Kroparica stream, that runs right through its heart, and admire the former ironworkers houses embellished with decorative wrought iron. 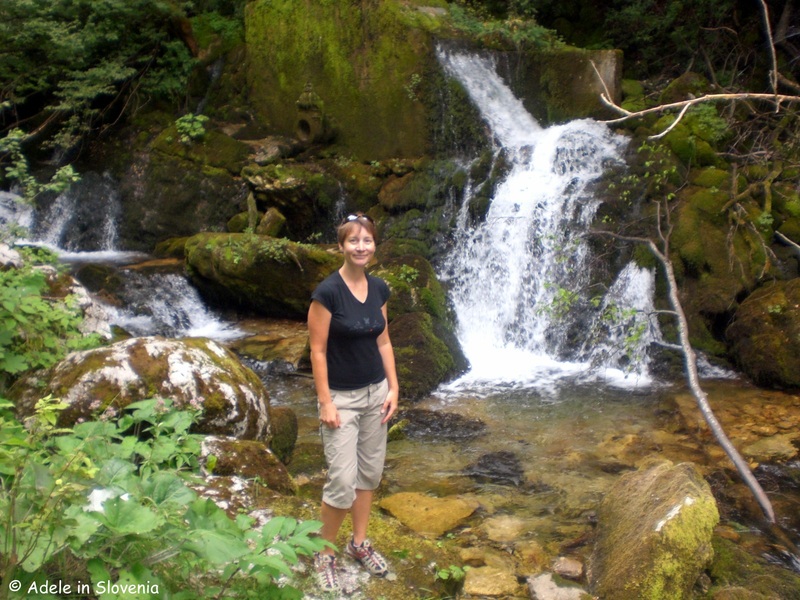 If you’d like to make a day of it, why not take a hike up to the Vodiška planina highland. 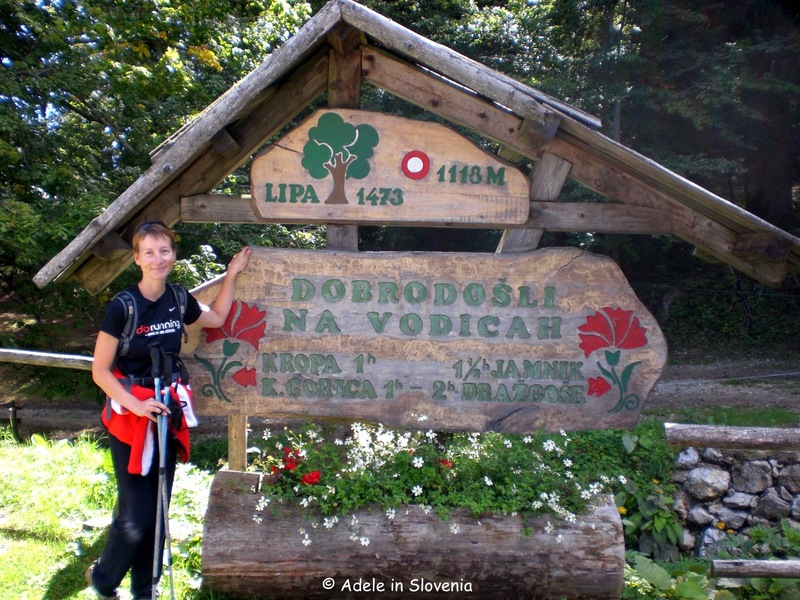 You can choose to take the steeper route (marked ‘Vodice – strma pot, 1hr 15mins) which begins at the parish Church of St. Leonard, one of the two churches in the village. There is a small parking area beside the church or otherwise you park in the centre of the village, by the memorial, and take the steps which lead between houses up to the church. 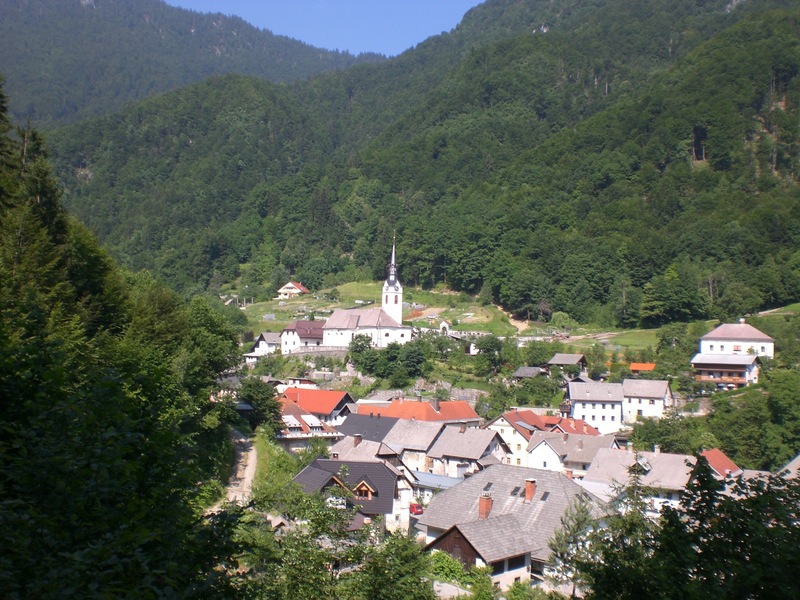 Or, alternatively, there is another path that is found by following the road through the village in the direction of Jamnik. The path begins on the bend in the road next to the former Slovenian smelting furnace (Slovenska peč). 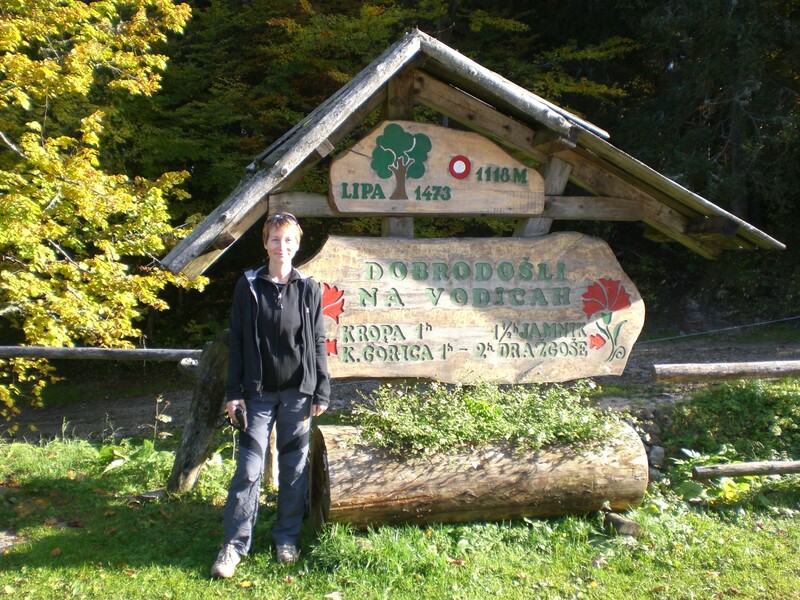 Both paths eventually reach the highland and the Partizanski dom mountain hut where you can get refreshments and tasty home-cooked food – the štruklji are particularly popular! When the weather is as hot as it has been in the past couple of weeks, which by the way I’m most definitely NOT complaining about, its time to seek hiking routes that are, as much as possible, in the shade. So this week here’s my suggest for a great circular route, which is entirely in the cool of the forest, leading to the highest point of the Jelovica plateau and beginning from the one of my favourite villages in this area – Kropa. Whenever I visit Kropa when the sun is shining, I have visions of myself living there. The village, with the Kroparica stream running right through its heart, and the houses embellished with wrought iron, really does look lovely when its bathed in sunshine. However, I know in reality, that life here probably isn’t that easy as the village’s location, nestled snugly at the foot of the far eastern corner of the Jelovica plateau in the Lipnica Valley, means not only that it is somewhat remote, but also that during the winter months there are very few hours of sunshine, which is something I definitely wouldn’t cope with! So, I just have to make do with visiting – and I’d certainly you do too! My walk leads first to the the Vodice Highland (Vodiška planina). Since I prefer to take the steeper shorter route up and the less steep but longer route down, I have described it in that direction. 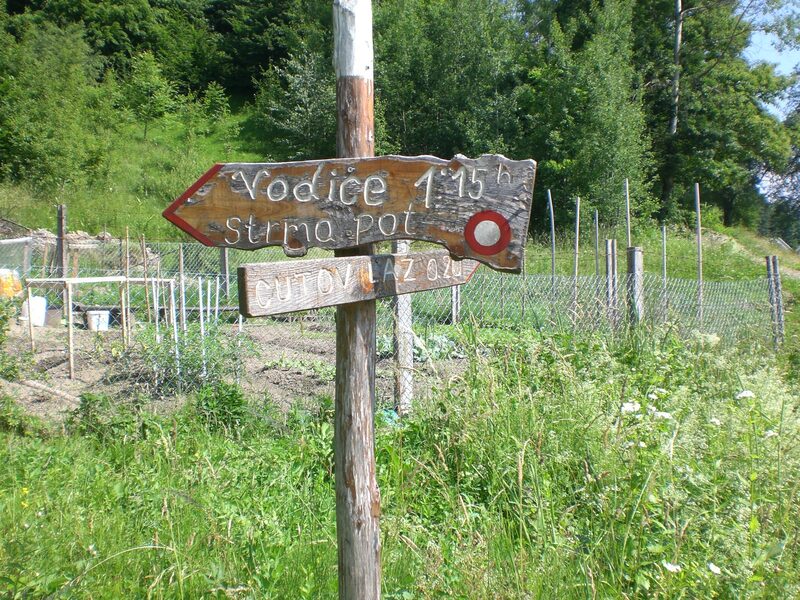 However, of course if you prefer it can just as easily be done in reverse, instead following the signs for Vodice rather than for Jamnik as described below. Begin at St. Leonard’s Church, one of the two churches in the village. There is a small parking area here or otherwise park in the centre of the village, by the memorial, and take the steps which lead between houses up to the church. Take the path signed ‘strma pot’ – this means ‘steep path’ – and it is! 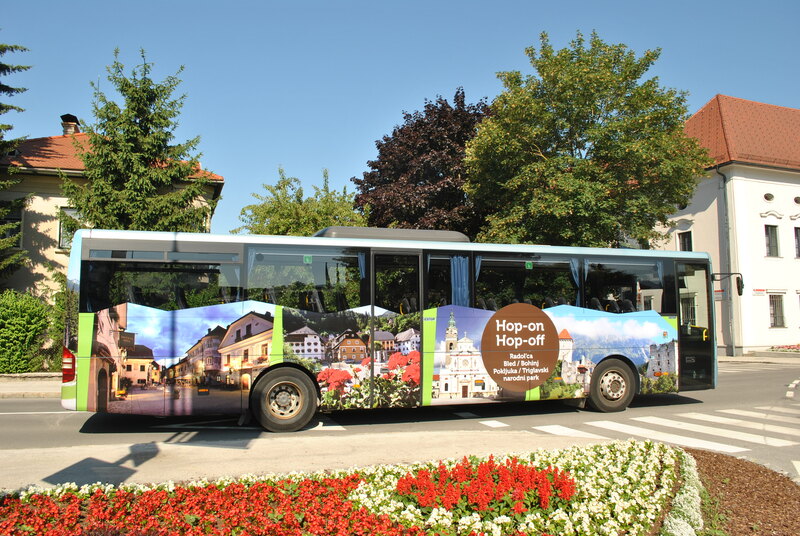 It takes just over an hour to reach the Vodice highland. 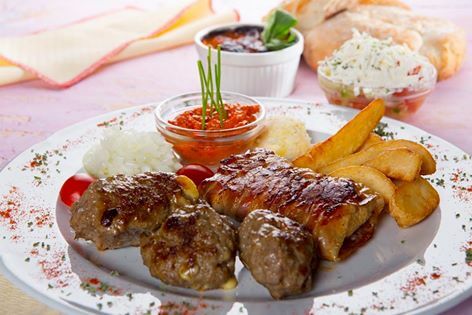 On reaching the highland, if the mountain hut is open, take a rest and enjoy some of the great home-cooked food – štruklji and strudel are particularly recommended here! If you don’t want to continue any further, from here you could take another longer, and slightly less steep, route back to the village. 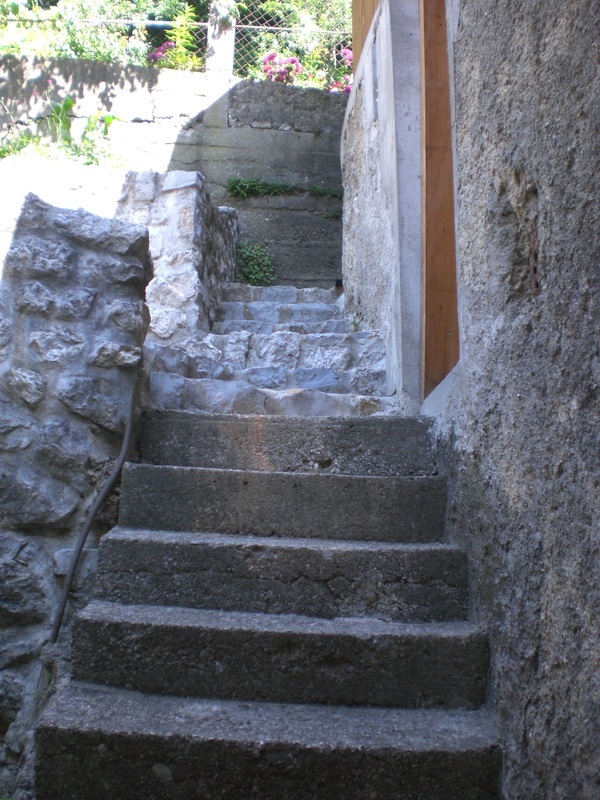 Alternatively, continue with the hut on your right and outbuildings on the left, a further 100 metres or so until you see a sign to Jamnik and Dražgose. 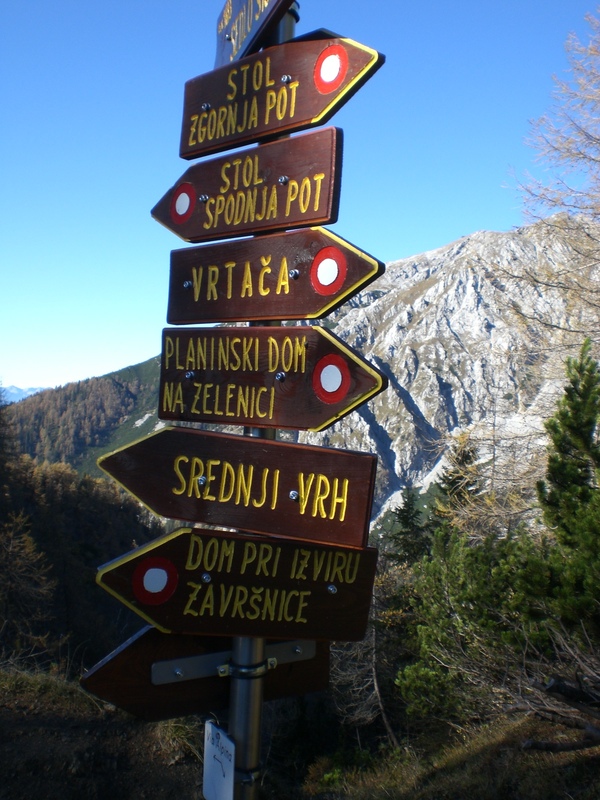 From here the path is obvious and just keep following the signs to Jamnik (where there is a choice, choose Jamnik not Dražgose). 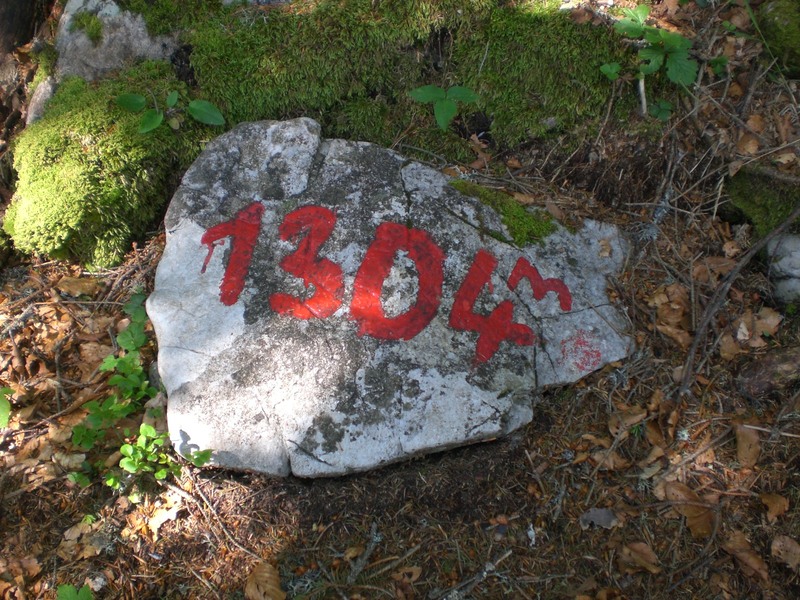 The path climbs slightly up to the highest point of the Jelovica plateau, Črni vrh, at 1304m. Of course one of the downsides a walk in the cool forest can be the lack of views, so be sure not to miss the 2 viewpoints. 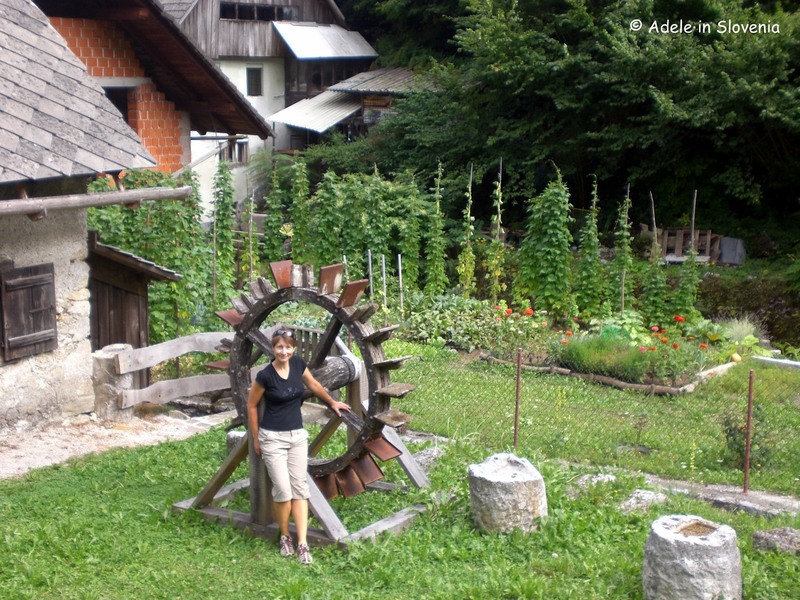 The first is just a few minutes from here where there is a clearing with panoramic wonderful views across the Radovljica plain and the peaks of the Karavanke and Kamnik Savinja Alps. From here on the path begins to gradually descend. 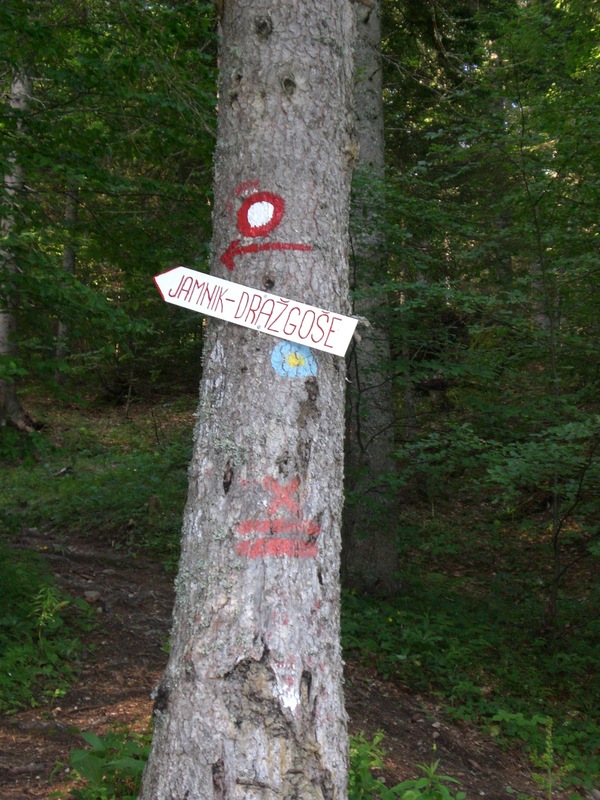 Just keep following the signs to Jamnik, just being careful after reaching a dirt road where the path goes right then shortly after left more steeply down through the forest. It is marked but the first sign is easy to miss. 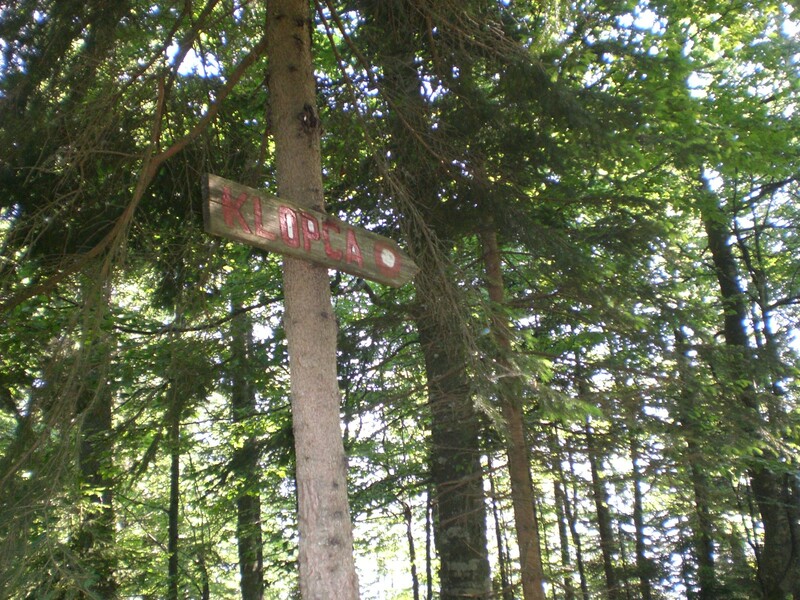 Another viewpoint is reached by taking a 2 minute detour of the path at the sign that says ‘klopca‘ (benches). 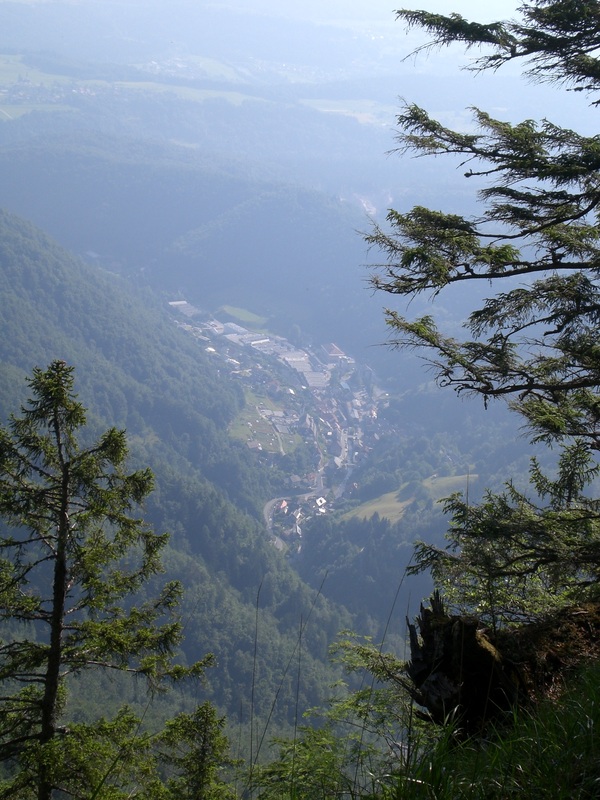 From here you can see directly down to the village of Kropa and get a real sense of just how hemmed in it is. 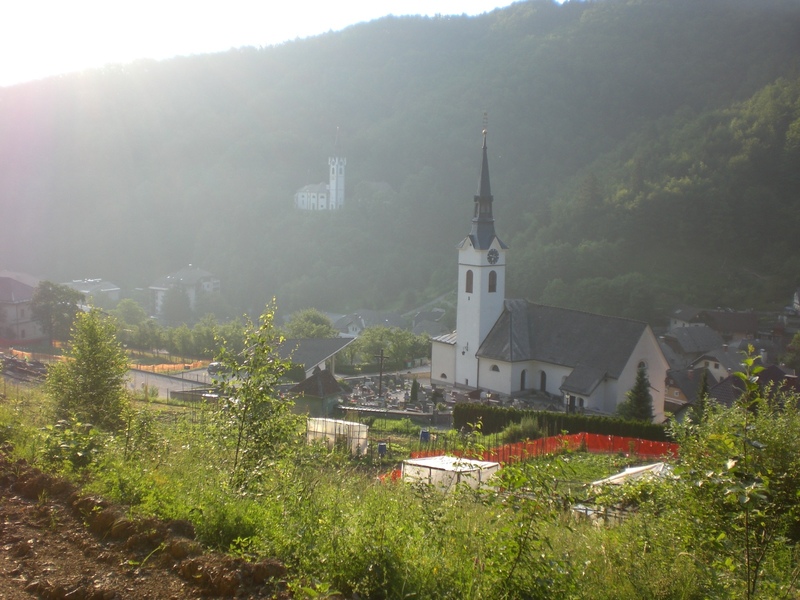 Eventually the path meets, and crosses, the winding road that comes up from Kropa, leading to the church on Jamnik. If you want to see the church then it is necessary to walk on the road for a while until the branch off towards the church. Otherwise, immediately on crossing the road the path continues on the other side, levelling off in places, before leading back down to the village of Kropa and the 2nd of the village’s churches, the Church of the Mother of God. On returning to the village you should also take some time to look around the village. 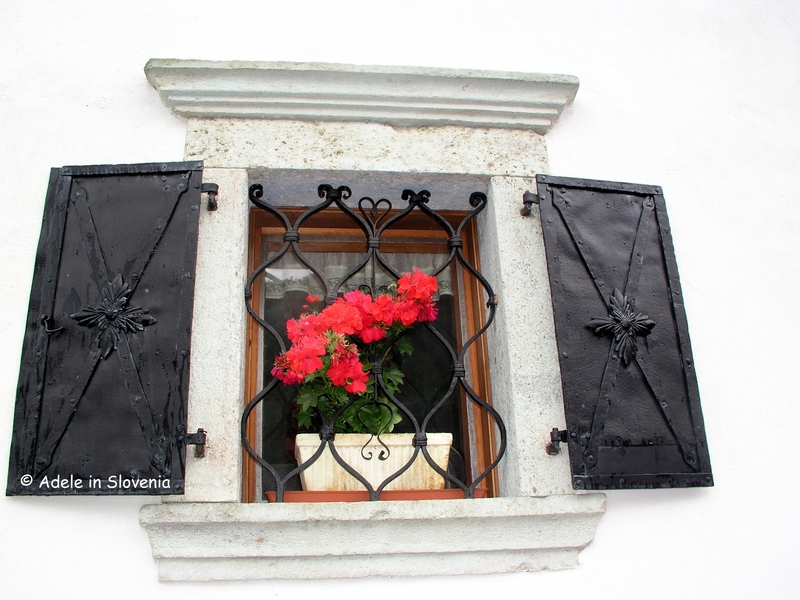 Everywhere you look there are reminders of the village’s past when it was the cradle of Slovene iron-forging and most of the homes and buildings exhibit some form of wrought ironwork. Phew, last week was, and thus far this week is, a scorcher. I’m not, though, complaining! I never do when it comes to the heat as I much prefer it to the cold, snow and drawn-out winters. 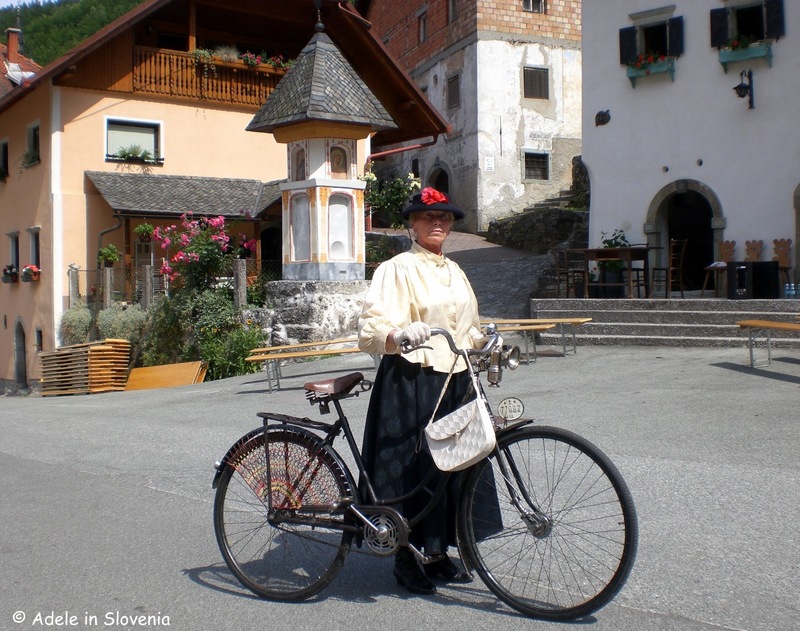 There is no shortage of things to do when the weather is like this, so this week I thought I’d offer some suggestions, in no particular order, for surviving the summer heat in, and around, the Radovljica area. 1. ICE-CREAM! Lots of it! Ok, so I said above ‘in no particular order’ but I confess that ice-cream comes in at, or at least near, number one on my list! I can think of at least 6 places that sell ice-cream in Radovljica, though there’s probably more, many of which produce delicious homemade stuff too. 2. THE SAVA RIVER – in it, on it, by I, or even over it. You won’t catch me dipping even my big toe in it – it’s too cold for me – but those hardy enough to brave the icy water can take a dip in the river at various places. I prefer to walk by it, the new Sava River Trail is ideal as the trail benefits from the coolness of, in places, running right at the river’s edge, and also through the forest – http://radolca.si/en/the-sava-river-trail/. 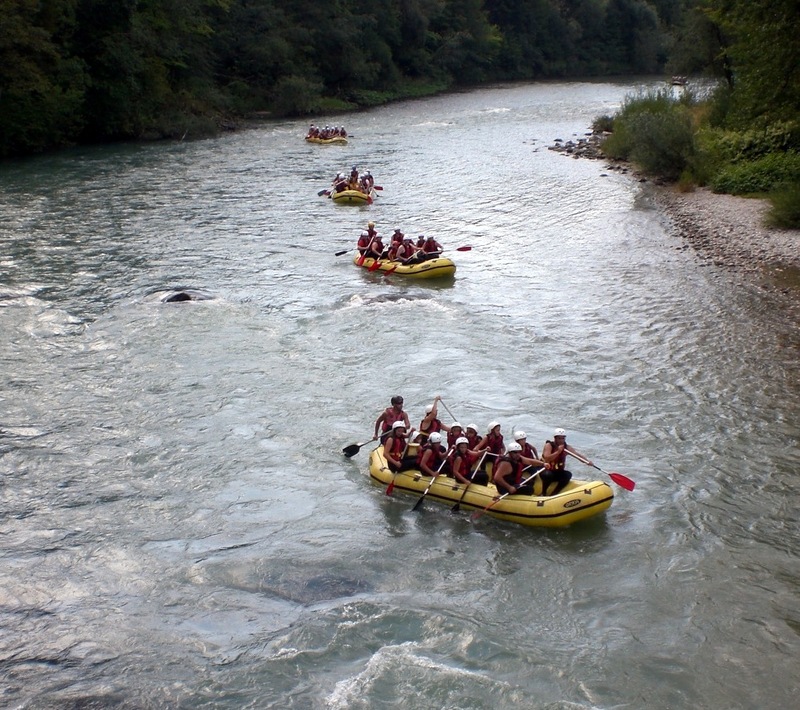 Others may prefer to enjoy the Sava river by partaking in one of the many water sports on offer such as rafting, kayaking, canyoning or canoeing – http://www.radolca.si/en/rafting-kayaking-canyoning/, or you can even zip over it on the zipline at Tinaraft. 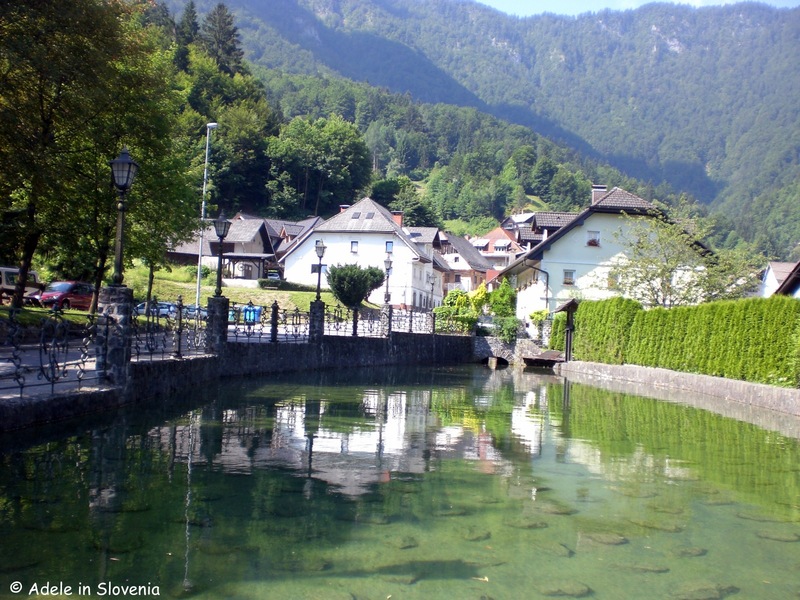 So, that’s my list which I hope provides some inspiration and ideas for spending summer days in, and around, Radovljica. I do hope, thought, that I’m not tempting fate by talking about the glorious weather since I seem to recall that this time last year the weather was similarly wonderful, but thereafter it went rapidly downhill for the rest of the ‘summer’. Fingers crossed for this year!